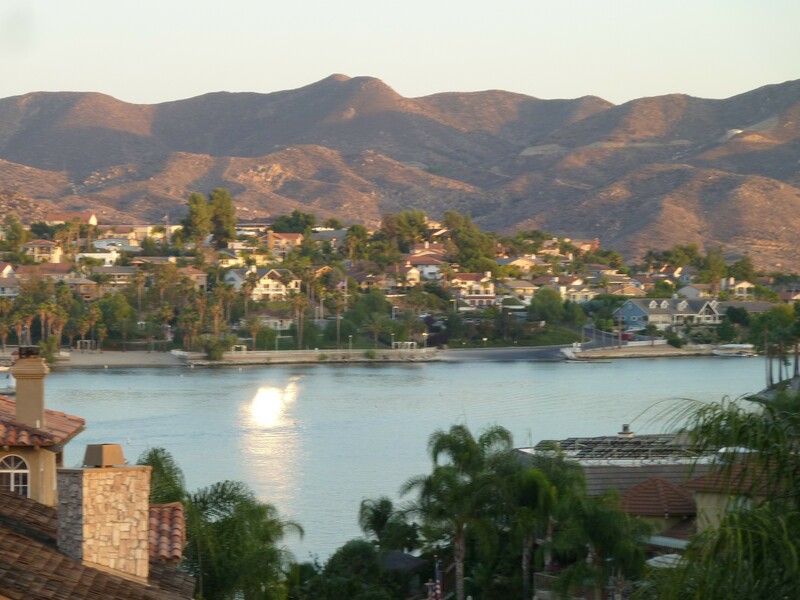 Welcome to one of the best waterfront homes in Canyon Lake. With 60' of waterfront, infinity edge pool and a kitchen to die for, this home is an entertainers dream. Mixtures of travertine, stone and full red granite slabs. Custom iron and wood doors invite you into a grand entry. Travertine flooring and hand-hewn stairway with custom iron leads you to the kitchen, indoor and outdoor living areas. The impressive kitchen has custom alder cabinets, copper sinks, side by side double Dacor refrigerators, double oven and 6 burner cooktop with warmer drawer, under counter microwave and island with copper prep sink. A full wet bar with a backlit onyx countertop and 50 bottle wine cooler. master with retreat and balcony. master bath with a disappearing plasma tv over the spa tub, master closet has wet bar for coffee or cocktails on the master terrace. Surround sound inside and out w/ audio, video, lighting and temperature controls in every room, and dedicated AV room. The outdoor space is as amazing. Covered patio with built-in barbecue and big screen tv, surround sound and ceiling fans. Tropical landscaping leads you down to the resort style pool with a lazy river and slide. Deck area for entertaining and covered dock with two hydro lifts. There is crown molding, solid knotty alder doors and ceiling fans throughout, along with an elevator, full solar and a 3 car garage. Must see to appreciate the dedication to excellence in this four bedroom, four bath lakefront home. Welcome to your luxurious tropical paradise! This Spectacular Waterfront pool home is located on the main lake and offers breathtaking views from every room, multiple decks and balconies. Enter through the custom iron glass double doors into the formal living room with fireplace, continue on into the great room featuring endless views, vaulted ceilings, custom built-in entertainment and bookcases, stately fireplace with custom mantle and palisade ceiling fans that give the look and feel of the tropics. The Gourmet kitchen is a chefs dream with granite counters, custom cabinets, oversize island, breakfast bar, and double oven. Formal and informal dining room, private office, travertine floors, recessed lights, and vaulted ceilings are just a few things this stunning home offers. There are two master bedroom suits(one located on main floor). The downstairs master bedroom and bathroom is luxurious and continues to impress with dual sinks, custom cherry wood vanity cabinets, separate tile shower, huge soaking tub overlooking the lake, wet/coffee bar and private viewing deck. This 1/4 acre of beautifully landscaped, low maintenance grounds feature a private driveway, a sparkling pool, spa, elegant palapa umbrella, Outdoor kitchen, outdoor bathroom, outdoor surround sound, and a private sandy beach perfect for play or relaxing. To complete it all enjoy your very own oversize covered boat dock with hydro lift and huge outdoor storage room for all your ski and water toys. The gem is a gated family compound that is secluded, yet close to it all. Set between Corona and Temecula this property is close to the 15 freeway and a short drive over the Ortega Mountain (via Highway 74) to the beach. Built in the 20's and rebuilt in the 80's this home has old world charm with new world amenities. Once through the gated entry you're greeted with the charm and character rarely found in this area. The property is set up with basketball court, pool and spa, detached 6 car garage, and this beautiful home overlooking it all. The home has 4 bedrooms with one down, two family rooms, formal dining rooms, kitchen with breakfast nook, basement/shop, and master suite. The kitchen opens to a patio over looking the pool and basketball court so you can enjoy watching the kids play or look out in the distance and see the skydivers flying over Lake Elsinore. This truly is a compound perfect for any family, as that is what it has been for the current owner. Hands down, this Italian home definitely offers one of the best views in Canyon Lake! Price to sell at $899,000, with 4381 square feet of living space, four bedrooms, three baths and two powder rooms on separate levels. Exceptional features include a state of the art theater room, upgraded decking, view areas across the entire back of the home gazing onto views from all three levels of the home, and a master and main secondary bedroom with perfect lake views at one of the highest points in Canyon Lake. The sparkling saltwater swimming pool is ideal for those who worship the sun, and was newly plastered just year ago. The gourmet kitchen has been recently remodeled and features new milk white etched cabinetry, beautiful granite and exceptional detail down to the polished Travertine floors. Step out from the kitchen to the main covered deck viewing the lake and featuring a new BBQ pavilion complete with bar seating and small built-in fire pit. This home is definitely one of a kind and a absolute "must see" if you are looking for a view home in Canyon Lake. This rambling California Ranch style horse property, pool and panoramic view home sits on a gigantic “all use able” 91,000+ sq.ft. hilltop lot. Custom built one story 3,400 sq.ft. home features three bedrooms, 2 baths, including a large master bedroom with ensuite and a vast closet, plus an office, an indoor laundry room and an attached 3 car garage. Smooth flowing floor plan into living room /Great Room:(approximately 1,200 sq,feet), area off the kitchen, plus a formal dining room and an additional step down living room. The Great Room has open beam ceilings, a stone fireplace, pool table (included), and a fancy oak bar. Kitchen with view, granite counter tops and a sweet breakfast bar. Zoned for horses, granny flat, R/V parking and more. Five minutes from the I 15 freeway, and about 30 minutes from Orange County by way of the 241 toll road. Horse property features include: 5 horse pens, 1 round pen, a comet wash rack. Property would be perfect for a contractor that needs extra storage. Gorgeous Turnkey Mediterranean Home with View… Located in the beautiful gated community of Canyon Lake! This spacious, yet comfortable home is all you need to have the best life style So. Cal has to offer. The home is 4,270 sq. ft, w/4 car garage for all your toys. 5/6 bedroom, 3 ¾ bath, 2 family rooms plus formal living and dining room. 2 offices, one upstairs with custom built-in cabinetry and one down. 4 updated wood burning fire places. There is a fully updated kitchen w/travertine flooring, granite counters and newer stainless appliances. Adjacent to kitchen is a breakfast room and eating bar. Refrigerator and tv’s included. The outside deck has automatic retractable smart awnings. The Master suite is spacious w/fireplace and deck. The recently remodeled master bath boasts a $10K freestanding cast iron soaking tub with a Schonbeck Crystal chandelier and glass shower for a true spa experience. Beautiful custom cabinetry and double sinks complete the Master Bath. Other features include forged double iron entry doors, wet bar w/sink, wine fridge, recirculating hot water, whole house fan, rain gutters, new water heater, new dual pane skylight, pool table w/ping pong lid included. Large interior storage, wireless security system. Artificial turf, drip system for low maintenance and Liftmaster smart garage door openers and more. Lower level is ideal as separate living quarters w/ outside access & incl. game room, 3 bedrooms and a bath. This home won't last! 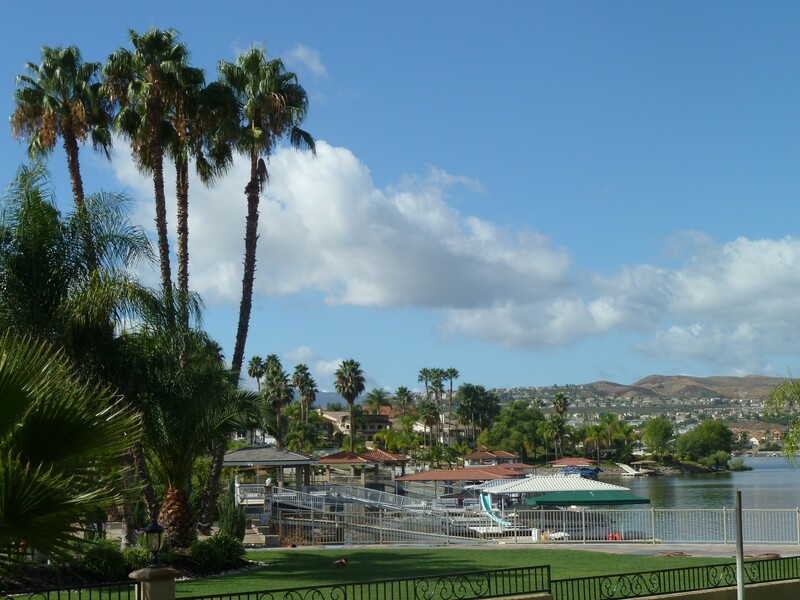 Highly sought EAST FACING SINGLE LEVEL Waterfront home located in the Gated Community of Canyon Lake. Pride of Ownership abounds this 3 Bedroom, 2 Bath featuring a Light and Bright Open Floor Plan with Gorgeous Bamboo Floors. Large Kitchen with Granite Counters, Stainless Appliances, Pantry and Breakfast Bar open to the Dining Area and expansive Great Room which features a charming Red Brick Fireplace, Beautiful Vaulted Wood Ceilings, Exposed Beams and inviting Lake Views. Additional Features include Newer A/C and Heating Unit, Ceiling Fans, Custom Barn Door on 3rd Bedroom, Lots of Storage, Whole House Fan, Newer Garage Door Openers with Keyless Entry and so much more. Large Master Suite with Double Door Entry features Vaulted Ceilings, Ceiling Fan, walk-in Closet and on Suite Master Bath which offers a Double Sink Vanity, Jetted Tub and Separate Shower. Endless Entertaining from the Covered Deck which extends the length of the House to your own Waterfront playground including Personal Dock with Hydro Lift. In Addition, this highly sought after Single Level features a 3 Car Garage with a Flat Driveway. Summer is coming, don't let this one slip away! This is the Canyon Lake home you've been holding out for!!! The living is easy in this impressive, generously proportioned home nestled at the end of a desirable cul-de-sac.. The list of upgrades start with the massive 4 car garage and extra wide driveway offering plenty of room for your cars, boat, golf cart, and toys. Upon entrance be greeted by the formal living room, and well appointed open-concept kitchen, dining room, and living space with cozy fireplace. The kitchen was made for a chef with a large curved island with bar seating, striking granite counter tops, and ample cabinetry. Truly relax in your Master bedroom suite with slider leading to the back patio and connecting master bathroom with walk-in closet, soaking tub, separate shower, and dual sinks. Stroll downstairs to a huge bonus/game room with surround sound speakers, fresh new carpet, and recessed lighting-a great space to gather and relax to watch a good movie or entertain. There is even a full downstairs bathroom and second entrance, very convenient for guest or an in-law suite. The backyard is private, equipped with an outdoor bbq island and palapa, extended concrete patio, tranquil water feature, terraced area for a jacuzzi, raised planters, grass area, and garden. 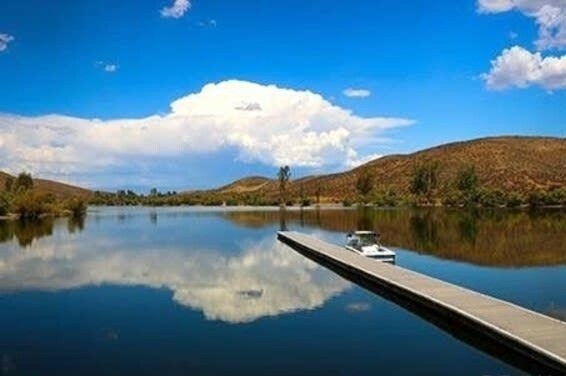 Canyon Lake is a private guard gated community with a private lake for boating, waterskiing, swimming, fishing, and kayaking. There are also 16 parks/beaches, a restaurant, pool, equestrian center, campground, golf course and MUCH more. View View View... A Beautiful "One of a Kind" Home in the Community of Copper Canyon in Murrieta.This home is a must see! As you enter, you are met by a spacious formal living/dining room with beautiful wood floors. there is a main floor office with the full bathroom! Continue into the gourmet kitchen which comes with granite counter top custom backslash, up grade cabinets, built-in stainless steel appliances, a kitchen island and walk-in pantry! The custom kitchen opens up into a large family room which is perfect for entertaining and intimate gatherings. This home has 2 fireplaces located in the living room and family room , Upstairs, there is a nice loft! The master suite offers a fireplace and a balcony that has amazing views. The oversized master bathroom has Huge closets, large soaking tub, vanity, dual sinks, and enclosed shower. There are four additional bedrooms on the second floor, with two of them sharing a jack & jill bathroom. Enjoy some quality time outdoors in the backyard! Offering nice build in Jacuzzi, built-in barbecue and great views! This property also resides within an Award winning-top rated School District. This gorgeous property just needs a good family to call it HOME! Gorgeous Custom Lake View Home with Elevator! Located in the beautiful private, gated community of Canyon Lake. 1st time on market! Built in 2004, 2658 sq ft, 4 bed.,3 bath owner/builder home has 2x6 construction w/ full size 75K elevator, extra insulation, security system, whole house fan, central vac & more. Low taxes & Low maintenance...The view is spectacular of the lake, hills & mountains. The perfect quiet location to watch Canyon Lakes' Annual Fireworks Show! The front entry is on the lower garage level & incl. 1 Ba, 2 Bed., one being used as a sewing room with a large work closet & storage. All Baths feature granite counters, custom tile & glass showers. For the main/upper level, choose to ride the elevator or use the beautiful staircase...the open floor plan on the upper level has a comfortable family room open to a spacious kitchen, island w/ eating bar & breakfast room. Kitchen has custom cabinetry, stainless appliances & granite counters. Deck looks out to stunning view! Formal dining room open to family room. The Master Bedroom has a huge walk in closet. Master Bath is well appointed w/ cust.cab., granite & jacuzzi tub w/ lge sep. glass shower. This well maintained home shows pride of ownership! A great primary residence or vacation home. Resort-style amenities include 383-acre private lake w/ access, 18-hole golf course, lodge, equestrian center, tennis & pickleball courts, baseball fields, olympic size pool, parks, beaches, water ski slalom course & more. Beautiful oversized home offering 4 bedrooms, 4 full sized baths, a large office downstairs, bar, pool, and plenty of space. One of the few pool homes for sale in the neighborhood and one of the largest. Solar panels leased making electric bill nearly obsolete. Located within the Gated Recreational Community of Canyon Lake awaits this Beautiful 5 Bedroom Home! Currently the lowest priced 5 Bedroom Home in the Lake it features a Formal Living Room, Formal Dining Room, Eating Area off of Kitchen, Great Room/Family Room off of the Kitchen with charming Red Brick Fireplace, 2 Bedrooms and a Full Bath Downstairs, 2 Bedrooms Upstairs one with it's own Private Patio with Hillside views plus Large Master Bedroom with Retreat/Sitting Room and Fireplace with Sliding Doors out to your private patio with breath taking views of the Snow Capped Mountains. This home has it all including a Spacious and Open Floor Plan, Granite Countertops in the Kitchen, Double Oven, Pantry, Ceiling Fans, Central Vac System, Intercom System, Dual A/C Units, Large Jetted Tub in the Master Bath, Huge Master Walk In Closet, Upstairs Laundry Room with Lots of Cabinets, Recessed Lighting, Mirrored Closet Doors, 3 Fireplaces, tons of Storage, 3 Car Garage with Storage area and so much more! The backyard is an entertainers dream offering an expansive covered patio, low maintenance yard and amazing Views! Truly a must see so schedule your viewing appointment today! Very clean and ready to move into South Torrance Parkwood Villas quiet End Unit with views of the neighborhood and pool, excellent walkability to everywhere and everything. This home features Two bedroom / Two remodeled baths, dual pane sliders and windows throughout, smooth ceilings, newer carpet, plantation shutters, stainless steel kitchen appliances and newer balcony membrane. Unit also boasts convenient in-unit laundry, separate dining area, step-down living room with gas fireplace, central heating, large master suite with walk-in closet, two side by side subterranean parking spaces and extra storage. Strong and well run HOA with amenities including pool, spa, & lounging area, gated entrance & parking, monthly dues covering water, trash, amenities and exterior maintenance. Nearby to shops, services, dining, Torrance best rated schools, the park, Del Amo mall, the beach. This is a Winner! New Price on this Amazing Four Bedroom Single Story Pool Home with Quality and beauty everywhere inside and out. Delightfully designed rock work and pavers along the front yard path, lead to a home with an interior combining gentle elegance and exquisite taste. Luxurious flooring of fine woods and stone; and selective use of attractive carpeting. Architecturally beautiful walls, arches, and vaulted ceiling designs. Perfectly selected and placed lighting fixtures throughout. A view of the Beautiful Pool from the large Main Floor Master Bedroom that opens directly to the pool area. The home's main interior entertaining area opens to the outdoor patio, pool, spa and fire pit, with adjoining built-in sitting area with plenty of room for entertaining. BEAUTIFUL kitchen with the most amazing granites, cabinets, and built-in appliances. Fabulous Oak Cabinetry throughout the kitchen and the entire home. An amazing floor plan! GORGEOUS cabinets and countertops everywhere. The only way it can be described is to see it in person! This is truly a great Canyon Lake home. Turn Key 2 story home loaded with upgrades inside and out. This 3 bedroom 2.5 bathroom home offers granite counters, stainless steel appliances, ceramic and wood flooring, crown molding, solid maple cabinets, whole house fan and built in TV cabinet for 80" TV. Outside you are welcomed by a large rock pool and spa, waterfalls and an outdoor kitchen with cover and BBQ surrounded by mature landscaping. You can’t beat the endless panoramic views of the main lake in this charming one story home! Perched on the hillside of one of the most desirable streets in Canyon Lake! This fully remodeled home has a fantastic outdoor living area that is perfect for entertaining, fully equipped with an outdoor fireplace and Alumawood patio cover. On the view side there is a spacious balcony that runs the length of the home where you can enjoy the most spectacular views in the community! Fully equipped with solar panels, you can save thousands on Electricity. With hardwood floors throughout, water softener, roll down screen door for the garage, brand new stainless steel appliances and granite counter tops, this is the perfect place to call home! Professional pictures and video will be added Tuesday 2/26! Your Backyard Oasis awaits! Entertaining made easy with a sparkling pool, spa and tranquil waterfalls, cozy custom firepit, horse shoe pit, large grass area, and spectacular unobstructed VIEWS! Nestled at the end of a cul-de-sac on an a private 1/4 acre lot this beautiful single story home is sure to delight any pallet with fresh paint inside and out, new gorgeous rustic wood laminate floors, bright new baseboards and crown molding. Upgraded dual pane windows throughout allow in an abundance of natural light along with recessed lights and stylish fixtures. A spacious front living room plus dining room area will greet you as soon as you walk in. The main living room is a spacious yet intimate setting complete with built-in surround sound speakers-perfect for movie night. Continue down the hall on to the family room with a charming brick fireplace and kitchen. The Kitchen is adorned with rich brown cabinetry, brushed stainless hardware and sparkling white subway tile backsplash. All 4 Bedrooms are newly carpeted. RV parking potential, no rear neighbors, top rated schools, and located near all the conveniences including shopping, restaurants, and freeway access. BIG PRICE REDUCTIOIN! !Beautiful view of the 5th green ,this golf course home, located in the gated community of Canyon Lake, sits on top of the hill, large lot. upper and lower deck, hot tub, included in the sale. The flooring has been updated: a whole house fan, new lighting, upper and lower deck covered patios. granite counter tops, updated bathrooms, a must see home., three car garage door, Low HOA fees, lake, marina, tennis, pickle ball. senior center, equestrian center, lodge dining, championship golf course, parks, beaches, are just a few of the amenites in this private community. . Bring us an offer! MOTIVATED SELLER. Beautiful cul-de-sac home overlooking the golf course with stunning views plus RV and boat parking. The master bedroom has vaulted ceilings and a slider to the back patio and extra large backyard including a shed. There is a lovely new vanity plus a mirrored wardrobe and new large shower. The living room and family room open up to the great kitchen featuring maple with granite counter tops. This home has gorgeous lighting, new flooring only a few years old and an extra room used as an office! This property backs to the lake with Amazing Views from the Kitchen and Family Room, Downstairs Bedroom and Deck off the Master Bedroom! The home offers 4 Bedrooms, 3 Full Bathrooms, Large Open Floor Plan with Family Room off the Large Kitchen Area, Vaulted Ceilings in Living Room with decorative stair banister, Granite Counter Tops in Kitchen and Bathrooms, New Interior Two Tone Paint, Exterior Trim is being painted this week, Central Air and Heating, Separate Indoor Laundry Room, and great concrete patio rear yard backing the lake with relaxing views. The community is gated and has amenities such as a large pool and spa, BBQ and even paddle boat rentals. Don't miss this Highly desired Single Story on a Corner Lot located in the Community of Rosetta Canyon. Built in 2013, this Home features 12 Paid Solar Panels and still has several years left on the Builder's 10 Year Warranty. Features include 4 Bedrooms, 3 Bathrooms, Great Room open to the Dining Area and Spacious Kitchen, Upgraded Flooring, Water Softener, Recessed Lighting, Ceiling Fans, Indoor Laundry Room and Lots of Storage. The spacious Kitchen has a Large Island, Stainless Appliances with Double Oven, Pantry and beautiful Granite. The Master Bedroom is on the opposite end of the House offering a large Master Bathroom with Double Sink Vanity and Walk In Closet. Large Backyard with Concrete Patio the length of the House offers you a blank canvas to create an entertainer's delight. 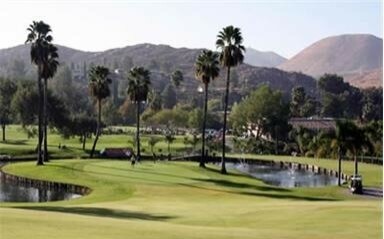 Conveniently located to the 15 Fwy, Schools and Shopping. Rosetta Canyon's countless amenities include a 23-acre park, playground, and picnic pavilions complete with barbecue facilities and picnic tables. Also located within Rosetta Canyon is a K-6 Grade School. This beautiful home is located in the most desirable active 55+ Community the Colony. A wonderful 2 bedroom with a large loft that can be converted to a 3 bedroom. The upstairs offers a private guest bedroom and full bath with a Den/Family room. This floor plan offers complete privacy up stairs for guests or grand babies when they come to visit. All of the main living is on the ground floor so you never have to go up the stairs! The double door entry leads into vaulted ceilings in the formal dining room and Living room. The 1st floor master bedroom suite offers a great walk-in closet huge master bath with double sinks, jetted tub, separate shower and water closet. Enjoy the large kitchen with breakfast nook, large island, double ovens and the kitchen opens to the family room with gas fireplace, entertainment niche and a glass slider that opens to a private patio. Your back yard views are of the golf course with no homes behind you. Enjoy a Club House, PGA-endorsed California Oak Golf Club, fitness center, organized social events, grand ballroom, theater, arts & crafts, library, beauty salon, billiards, salt water pool, tennis, bocce ball and shuffleboard courts. The garage leads into the indoor laundry room with a wet sink and lots of storage. HOA fee includes water and gardener of front lawn. This guard gated resort style living is close to shopping and medical. Do not miss seeing this home!! Upstairs bookcase will not remain with the property. This beautiful 2,726 sqft home is located on a corner lot in the quiet community of Canyon Hills. The kitchen has been recently upgraded with granite countertops, an oversized center island, stone backsplash and ceramic wood tiling. This two story home offers 4 bedrooms, 2 1/2 bathrooms, an upstairs loft, an upstairs laundry room and a possible fifth bedroom located downstairs. Separate shower, soaking tub and walk-in closet in the master bedroom. Brand new 20k energy efficient heating and air conditioning system with zoning. Large backyard for entertaining, 2 car garage for storage and vehicles. This lovely community offers three different pools and spas, tennis courts, basketball courts, playgrounds and even a dog park. Sits between the I-15 and 215 for easy access to highways, schools and restaurants. Welcome home to a rare find in desirable Canyon Lake. New real “Bruce”hardwood floors are absolutely stunning with any decor. Updated with beautiful granite countertops sure to impress. The master bedroom boasts a large walk-in closet and long double sink vanity. Inside laundry room with plenty of storage. Crown moldings in all the bedrooms. Low maintenance yard and a “hidden” garage add to the surprises you will find here. 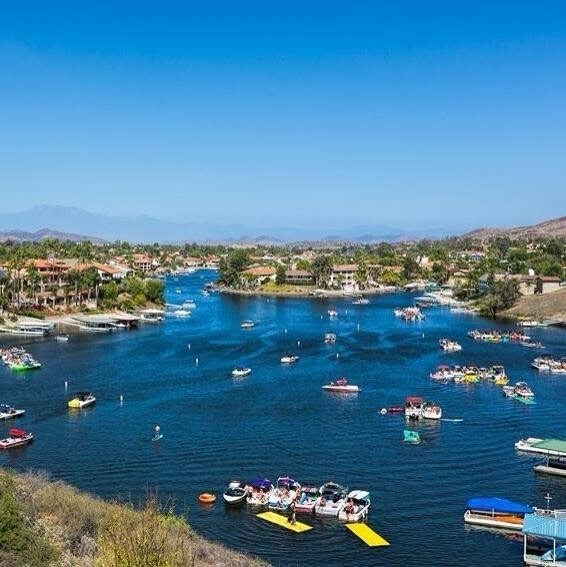 Canyon Lake is the community of your dreams including a private lake with skiing and wakeboarding, supreme golfing, club house and lodge, community pool, equestrian center, beaches galore, tennis courts, senior center, campground, and neighborly activities all year round. Well desired single story in the private gated community of Canyon Lake. This home features 3 bedrooms 2 bathrooms, 2022 SQFT. Single story, over 60 Feet of flat RV parking, private pool and spa and 2 car garage. The home has stairs to a rooftop patio for entertaining or sunset dinners. In need of a little updating but located perfectly in a quiet location. Beautifully upgraded 2017 newer build home located in the gated Westridge neighborhood of Canyon Hills. The main level includes a beautiful upgraded kitchen with modern shaker style cabinetry, stainless steel appliances, granite countertops, recessed lighting and gorgeous "wood" tile flooring. The kitchen is open to the eat-in dining room and great room which offers custom drapery and lots of windows for natural light. The downstairs has a 1/2 bath, lots of storage space and an attached 2-car garage. Relax and enjoy your low-maintenance backyard with artificial turf, awning, private block wall fencing and a small water feature. Upstairs you will find all 3 spacious bedrooms, a laundry room with tons of storage and a full guest bathroom. The large master bedroom opens to the master bath, including an oversized tub, dual vanity and a large walk in closet. The home is fully equipped with fire sprinklers and features a tankless water heater. Westridge in Canyon Hills is one of the most desirable communities in the area with a sparkling pool, beach entry, wading pool and cabanas, full tot lot, bbq's, firepits and bark park all within walking distance. This home is beautiful inside and out! Check out this Cozy single story corner lot home that resides in a Highly desirable neighborhood in Menifee...This Home is beautifully landscaped... Home has new exterior paint, new flooring, upgraded Counter tops in the Kitchen, a cozy fireplace in the family room. A spacious backyard that is low maintenance and it includes a built in BBQ and above ground spa, perfect for entertaining...indoor laundry room...plenty of cabinet and storage space. A great starter home and the sale of the home includes the Refrigerator, Washer, and Dryer. This home has solar panels, no HOA...House is clean and ready to move in. Nice 4 bedroom two bath home all on one level. The master suite has it’s own private entrance. Open family room with cozy fireplace. Dining area just off the kitchen. Large flat private back yard. Two car attached garage with extended driveway for a boat or RV. A super starter home or solid investment property in Beautiful Canyon Lake. Fabulous "Casa Murrieta" Gated Community in Menifee! 55+ age restriction. This home has lots of wonderful upgrades. The kitchen is remodeled with a chef Samsung stove, beautiful granite, and white cabinets. Porcelain tile that resembles wood flooring. Open kitchen family room combination. Sit by the cozy natural gas fireplace and enjoy entertaining friends. 2 bedroom 2 bath, with an added on large bonus room. Spacious for numerous types of hobbies. Upgraded light fixtures and ceiling fans. 2 car garage with a laundry area. Back yard is a gardeners haven, various trees galore...fig, lilac, pear, plum, Meyer lemon, avocado, mandarin and navel. Lots of room for a garden, more trees and happy hours. Sit and enjoy the birds and blooms. Community offers walking trails in the common areas, pool, spa, Association takes care of the front yard maintenance. Enjoy the newly renovated fountain as you enter the gates. Close to shopping, restaurants and 215 Freeway! Active & friendly senior community. 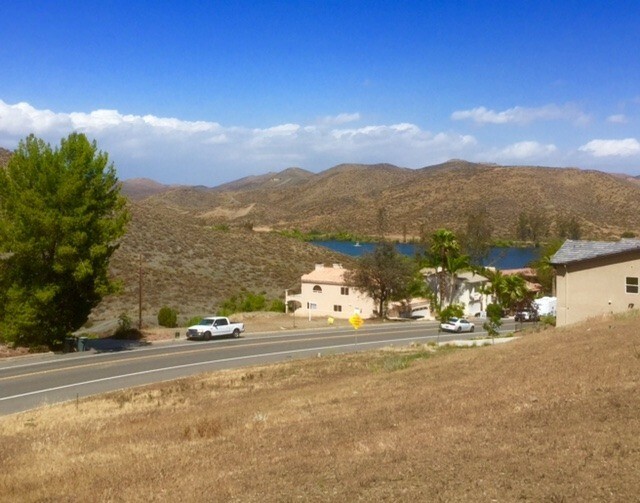 Views of Lake Elsinore, Views of the Ortega Mountain range and Views of the surrounding hills. Beautiful place to build your dream home perched high up on your own hop. Majority of the 13.30 acres are hillside but modify the top pad(s) to create the perfect setting. Buyer to verify property lines and markers (if any). Driveway on property has a Right To Pass type easement . Great investment opportunity! Looking for a buyer willing to buy as is! Great potential with this 2 bedroom/2 bath floorplan - formal living room, breakfast nook, dining room or den, enclosed attached lanai, inside laundry room, single car garage with additional golf cart carport, attached workroom with outside entrance! Two story, 2 bed 1 bath barn style home on rare double lot in BIG BEAR! RV PARKING! Located in a zone that qualifies for USDA loan, 0 money down 1 minute from the airport, 1 minute from the lake, 2 minutes to food and shopping! Surrounded by world class fishing, hunting, skiing and snowboarding! Great rental property or call friendly Big Bear your new home! Interior in good condition awaiting your modern touches! BEAUTIFUL 1.81 ACRE VIEW HORSE PROPERTY HOME SITE, are your Ready for Country Living where you can build your own Custom Mini Horse Ranch (Stick Built and YES Manufacture Homes Allowed) Best part of this property it has two (2) Access Entry Roads into the property (Access from Alerich Street and/or Gretchen Lane). City Water on Gretchen Lane adjoining the property. Property Fenced on 3 sides of the property and you have neighbors already living on each side of the property so the Utilities are available and close. Land is near level with Mature Trees, Plenty of room for a Pool, Barn, Horses, Pets “All Your Toys” and the Largest RV you can buy and so much more….Great Location with Less than half of a mile to Paved Roads. City Close with easy access to the 215 Freeway, Shopping, Hospital, Doctors, Schools, Restaurants, etc. Don’t miss out! Must walk this Beautiful piece of land, Access the property on Alerich Street. Note: Paid Percolation Test Passed+Report / Inquire regarding Some Paid Permits for a Manufacture Home Site and Foundation by the Seller. " LOW TAXES AND NO HOA "
Build your dream home with Lake Views! Located on a Premium Canyon Lake Street Across the street from Million Dollar Homes. Elevated Lot to maximize your panoramic lake views. Don't miss this opportunity! Luxury vacation home living on the main lake in Canyon Lake. This lease is not like any other on the lake. This home has been remodeled using the best of the best. The photos do not come close to showing this gem. It is a must see experience. The condo comes with full use of all the amenities of Canyon Lake and Treasure Island and comes with your own covered boat dock. Perfect weekend retreat or live like you are on vacation every single day. The assessments alone are almost $700 which is included in the rental price. This is an amazing opportunity! This home offers; SOLAR which is a significant savings especially during the hot summer months and is energy efficient!! 5 Bedrooms, 4 1/2 Baths, open floor plans with large formal living room and dining room. Huge kitchen with breakfast counter and granite counter tops! Family room with a cozy fireplace. Huge game room. Office and so much more! Located on culdesac street and no neighbors behind you. Three car garage. Immaculate 2 Master Bedroom Bath unit in the Historic down town area, home includes fridge and washer/ dryer, enclosed private patio with two car garage, open and spacious floor plan with vaulted ceilings, central heat & air conditioner, walking distance to Anaheim Packing District, parks, schools, stores. Beautiful Canyon Lake Home with character, Peekaboo view of the lake from the balcony, 3bdrm/2bth, formal dining room, family room, kitchen island, patio deck with a park like backyard with lots of shades and room for kids to play, AC, RV Parking. Located within the Gated Community of Canyon Lake features this 3 Bedroom, 2 Bath with just over 2,000 sf of living space located on a Corner Lot. Neutral colors throughout, Open Kitchen with Wood Laminate Flooring, Granite Counter Tops with Stainless Steel Appliances and a cozy Fireplace in the Family Room. Detached 2 Car Garage and Low Maintenance Yard make this Home a Must See. Available for Move in approx April 1, 2019. Beautiful 5 Bedroom, 3 Bath home in Murrieta! This home has it all and won't last long! You will enjoy the Modern Kitchen with upgraded Cabinets, Granite counter tops, Built In Microwave, Refrigerator and Large Kitchen Island. The Family Room has backyard access and a cozy Fireplace. Indoor Laundry comes upgraded Washer & Dryer and Built In cabinets for Storage. Built In Desk at the top of the Landing is a great work station. Large Master Bedroom with Walk In closet and Master Bath features Dual Sinks with Upgraded counters and Separate Tub and Shower. Huge Backyard,large patio slab, fully fenced, tandem 3 Car Garage, covered front porch. Hurry it will go fast!! Two-story home in Canyon Lake Community and it is located at the end of the cul-de-sac. Property has 3 bedrooms, 2.50 bath, and 2 car garage. Property had been newly rehab with new tile in entry way, kitchen, master and upstairs bathroom; Interior had been freshly painted; kitchen granite counter, master bedroom shower tub. Stop the car, this place is gorgeous! Three spacious bedrooms, Two full bathrooms, completely UPGRADED; wood type flooring through out, designer paint colors. Beautiful kitchen features; white cabinets, granite counter tops, stainless/black appliances, recessed lighting and opens to dining room. Family room with sledge stone and white trim accents. High ceilings. Guest bath with new vanity. Large master bedroom opens to back yard patio and has an en suite bathroom with new double sink vanity, soaking tub, separate walk in shower. All bedrooms have ceiling fans for energy efficiency. Finished two car garage, huge back yard and fully fenced! Hurry, this one will not last long! Renter's Insurance is required with a liability policy of $200,000. Great Location, Nice Temecula Home with 3 bedrooms and 2 1/2 Baths. Double Door Entry. This home features New Carpet and Fresh Paint throughout. Family Room features a fireplace. Kitchen has new Stove, dishwasher and Breakfast Nook. Large Backyard with Patio area, Firepit and Pergola. Two Car Garage. Home is currently being converted back to a 3 bedroom loft was previously enclosed.No pets. Live the Canyon Lake style at an affordable price. This 2 bedroom 2 bathroom home has just been freshened up with new paint, Carpet and flooring and so much more. Located in the Fairview Estates on a quiet cul-de-sac this home is move in ready and available now. This newly updated 2 bed, 2 bath home is located in the 55+ community of Sun City. This spacious home is 1404 sq ft plus a finished patio area. Features include granite in kitchen and bathrooms, new flooring and paint throughout. This lovely home is located near shopping, groceries, and many bars and restaurants. Come see it soon as it won't last long.